And we’re back! My apologies for the short break, but August has been a handful. 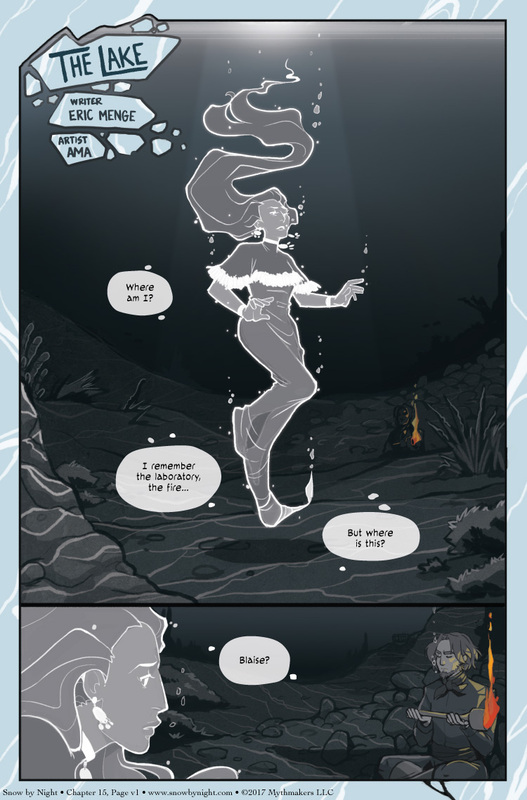 I’m now pleased to begin posting The Lake, illustrated by Amanda Gomes of Riven Seal! We pick up right where Ch15 left off. With Snow… well, you’ll see. It’s going to be a wild ride. Better buckle up. What happens next? See a preview when you vote for Snow by Night on Top Web Comics! When I work with artists I encourage them to give me input on the script. Amanda had a lot of ideas which made the vignette even better. I’m so pleased to have worked with her on this story! Last week was GenCon! We had a fantastic time! Check out the SbN facebook page or my twitter for pictures! And hello to everyone we met who are reading! It was a pleasure to meet you! Thank you for reading! Oo, nice coloring effect there with everything being monochrome but the torch. rofl. In more ways than one. Ooo, looks like we’re getting esoteric here. Love the use of the grayscale contrasting with the flame. Interesting — Snow has a whole different outfit and appearance now. Earrings; her hair has lost the braid; and she’s wearing a form-fitting dress down to her feet (not the wide skirt she had in Pieter’s lab) with a capelet that covers her throat. Her outfits change each time she takes shape, so I wonder if this is significant. Wind + Water = Ice spirit. Ice+ Fire = Water… Error. 3 elements do not make 1. Fire + Water = Steam + Wind = Storm? Is that a crack at a certain part of Christian dogma? Her new outfit reminds me of Weiss Schnee. Oh my god, he’s carrying a torch for her.